In this post we will discuss the NKBA Kitchen and Bathroom Planning Guidelines, by first stating the guidelines and then pointing out their importance and giving insight on solutions and practices based on my industry experience. Find out more about NKBA here. At least 30″ of clearance is required between the cooking surface and an unprotected/combustible surface above it. If a microwave/hood combination is used above the cooking surface, then the manufacturer’s specifications should be followed. Ranges vary widely in design but all play the same role when it comes to its purpose. Types of Hoods include: stainless steel, stone, mantel, shelf, brick enclosures, stucco, ceiling mounted, copper, custom wood, and more. 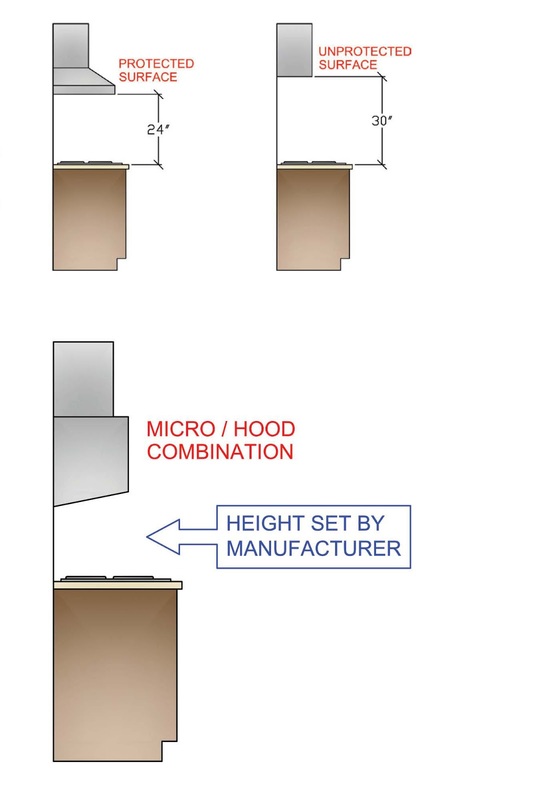 A hood should be a minimum of 30″ off the cooking surface and should not exceed 72″ A.F.F. (above finish floor). Most manufacturer warranties will be voided if the hood exceeds 72″ A.F.F. I find that the sweet spot is 70″ A.F.F. I like the hood to oversize the cooking surface. My rule of thumb is to leave 3″ of Hood overlap on either side; this looks better and is best for ventilation efficiency. An outdoor kitchen hood should definitely oversize the cooking surface because of smoke, wind, and other elements. An interior hood will NOT work outside because of the higher risk of flare up at an outdoor cooking surface. Some custom goods have pilasters/corbels that run down the walls flanking the hood; while this can look really nice, I find that it is not very practical because they tend to restrict your movements and counter space.